MMO Fashion is a network of visual databases for massively multiplayer online (MMO) games where the game community helps populate the database by uploading images. In addition, the sites maintain a character gallery of user-generated fashion and creations. The main page, MMO Fashion, is a blog that covers information about each of the other sites. We created the sites because we enjoy playing MMOs and want to help out the various gaming communities. 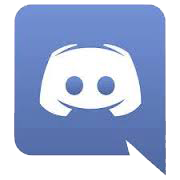 We’ve continued to add additional games even though we don’t have the time to keep up with every game because we believe these sites are useful to the community. Unfortunately, that means we must rely on user submissions to help keep the sites updated. Please note the game companies do not give us any special access to items or test servers. We pay for our own subscriptions and all in-game shop purchases. We have the same access to live and public test servers as any other fan site. All images available on the network are taken in-game by Exile, Dulfy, or users who have submitted them to the site. The MMO Fashion network is separate from Dulfy.net and does not share resources or ad revenue/donations. MMO Fashion is a woman-owned and service-disabled veteran-owned small business. Lite sites were a failed experiment of character gallery only sites that we started to fill a gap in that particular gaming community. These were games that have been around for awhile and we either missed the opportunity to cover them as full sites or decided not to. Unfortunately, the lack of a visual database doomed these to failure and we deleted the sites to save resources. Each of the sites is divided into two main parts, the visual database and character (for TOR Decorating you can replace the word character throughout this page with stronghold) gallery (except the lite sites which only have a character gallery). Essentially each site is set up the same with most of the differences due to the differences within the games themselves. The character galleries are built by users submitting their characters through the Character Submission Form located on the main menu of each site under Submit. Submitting the form immediately creates a post on the site with no assistance from us. You can view the 12 latest posts directly on the front page. Each site has a variety of character pages located on the main menu under Character that show different groupings of characters, usually by class or race (as appropriate). As the number of character posts increase, I usually add more pages breaking up characters into different groupings. These pages are grouped alphabetically and it can be difficult to use them to determine what has changed recently. Most of the sites also have the ten most liked posts of that particular category at the top of the page. On the side bar under Filter, you can filter the characters using any of the categories under “Characters” to help you narrow down exactly which type of characters you would like to see. Note that you can use more than one filter, but cannot use anything under “Database” to return more specific characters. You can choose “Characters” and nothing else to view all of the characters ever submitted to the site in the reverse order of submission (latest first). This way you can catch up on all of the latest submissions to the site if you haven’t visited in a few days. As people begin to submit multiple characters or multiple costumes per character, I add a Prolific Poster page to the site. This page shows submitters who have submitted five or more character posts to the site. The page links to individual pages for each submitter and I add thumbnails to each of their posts showing every character post they have submitted. This helps tie all of their posts together so if you like the work of a particular submitter you can see everything they’ve done in one place. Note that I have to do this manually and it can take up to 24 hours for me to update the posts (more if I happen to be out of town). Every morning, I post all of the new character submissions to the site on each site’s individual Twitter and Facebook accounts. You can access those accounts from the side bar of any page under Social Media Sites. TOR Fashion/TOR Decorating also has a Google+ account, but it was too difficult to log into multiple accounts so none of the other sites have one. Following these accounts also lets you see the latest posts without having to visit the site everyday. The other half of each site (except the lite sites) is the visual database. The intention is for each site to have in-game images of every equipment item in the game. This differs from traditional MMO databases that only use the in-game icons. Since we can’t datamine the images like you can with icons, it is nearly impossible to get in-game images of everything and is definitely impossible for one person to do it. This is why each site is set up as a community-driven site where the community must help maintain the site by submitting images. The completeness of each site is a direct reflection on how involved each game community is in updating the site. Note that it is not our intention to provide stat information for particular items. In some cases, we are able to partner with traditional databases to link our site to theirs, but that is dependent on whether or not the game has a well-maintained database with tooltips. Each site has a visual database submission page located on the main menu under Submit. There are a lot of fields to fill out so that I can easily determine exactly how to tag each category to make it searchable on the site. Please be as specific as possible when filling out the fields and don’t assume I know everything about the game because I rarely have time to play through to the end or keep up with the latest updates. The majority of pages located on the main menu are dedicated to grouping database items so you can more easily find them. You can use the side bar filter to help find specific items by choosing categories under “Database.” You can choose multiple categories to help narrow down items. Note that you have to be judicial when choosing categories. You can’t pick Armor and a Weapon or it won’t return any posts. You can choose something under Acquired and Armor though. Also, choosing anything under “Characters” won’t return any database posts. There is also a search located on the side bar. You can search for a specific item by typing in the name, but you have to spell it correctly. The search algorithm isn’t nearly as good as Google’s. Note that you can search for a particular item and it will return character posts as long as the submitter mentioned their character is wearing that particular item. For about half of the games, we keep a current listing of all items sold in the in-game shop with images of the items (as applicable). We pay for these items out of ad revenue so that you can view them before deciding whether or not you want to make the purchase yourself. Many of the sites also have simple beginning-level guides for the game or that site. Please take a look, you may find some interesting tidbits of information. On the top menu of each site are a link back to this About page, a link to the site specific Contact Form, and a link to the site specific Terms and Conditions page. Following that is a Google translate plugin to translate the site to another language. The side bar has a number of items. Search – Use this to search for an individual post. Make sure you spell the item correctly. The footer contains a PayPal donate button if you would like to help with our operating costs, copyright information for the site, and a disclaimer. The MMO Fashion pages use the DISQUS Comment System to manage comments. Comments on our site are still hosted on our server, but DISQUS modifies several things to make it easier to moderate and ties all of our sites (as well as any site that uses DISQUS) together. 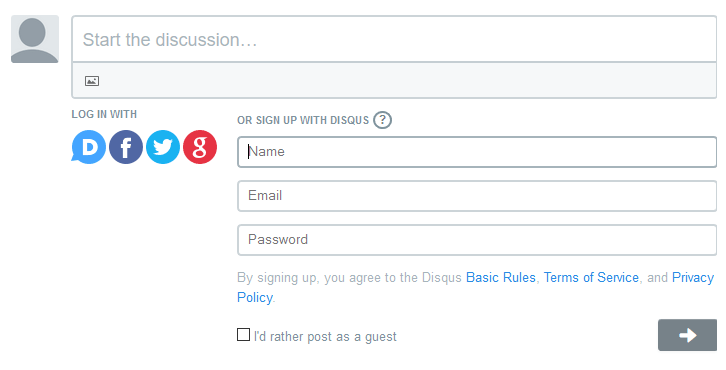 Creating an account with DISQUS does not create an account on our sites. Your DISQUS account is only applicable to the commenting system and has absolutely no bearing on any other portion of the website, including the post upvote system. It is not mandatory to create an account with DISQUS to comment on any of the sites. You can choose to “guest comment”. To guest comment, type your comment in the comment box of any site. Click in the “Name” box. That will display other options. Check the “I’d rather post as a guest” box. You will have to provide and name and email address, but you can type Guest and use a dummy email address. You can also choose to use your real name or a pseudonym associated with you, but you will not receive any of the benefits of signing up for an account. You can create a separate account on DISQUS or use the account settings of one of your social media accounts (Facebook, Twitter, or Google+). Creating an account on DISQUS provides several benefits. 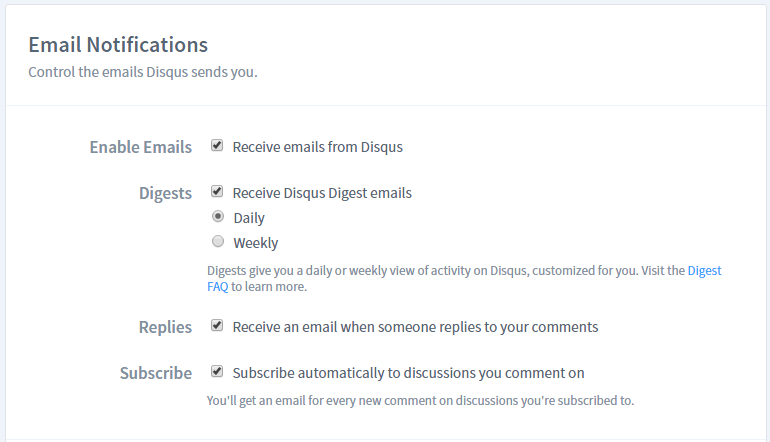 Unless you change the settings, DISQUS will send an email notifying you when someone replies to a comment you’ve made or also comments on a post you have commented on. You can change these settings under Profile, Email Notifications. One of the most beneficial things you can do with DISQUS is subscribe to a post without even commenting. I highly encourage everyone to subscribe to any posts they upload to the sites via a character or stronghold submission form. This will allow you to see all comments on your post and is very helpful when someone asks you a question about your character. To subscribe to a post, go to the bottom of the comments block right before the ads and click on “Subscribe.” If you are logged into your account, “Subscribe” will turn green and will add a green arrow next to the word. Once you do this, you will receive an email every time someone posts a comment on that particular post. You can unsubscribe by clicking “Subscribe” again. I would not suggest subscribing to posts other than those you submit or you will get inundated with emails. Note that DISQUS does have a separate upvote comment system that requires you to have an account to use, but you are not required to have a DISQUS account to upvote posts. The DISQUS comment upvote system is located underneath each individual comments on a post. Comments with more upvotes will rise to the top of the comments. The website post upvote system is located at the bottom of each post before the comments. Liking posts populates the “Most Liked” tables at the top of character galleries. We heavily moderate comments on the MMO Fashion sites. If you would like more information about what are acceptable comments, please see the specific Terms and Conditions of any site located at the top right of the each page or the general ones listed here. Exile is a disabled US Air Force veteran who spent 80% of her career overseas. In January 2013, she volunteered to help out with TOR Fashion and quickly expanded the site more than tenfold. Dulfy handed off the site to her in November 2013 and by February 2014 Exile had created the MMO Fashion network. She is the owner, administrator, designer, and primary moderator for all sites on the network. Now that’s she’s retired, she spends most of her time keeping the sites updated or planning her next trip so she doesn’t go insane from staying in one place too long. Exile does have characters for every game, but doesn’t have the time to level them all. Currently, she only has max-level characters in SWTOR and ESO. You can also get a hold of her on Reddit, MMO Fashion Discord server, or you can follow her on Twitter. NOTE: She no longer posts on r/elderscrollsonline because the mods in an effort to cut down on customized character posts refuse to allow her to post anything that says ESO Fashion. Dulfy has been providing high quality guides and walkthroughs at Dulfy.net for various MMORPGs to help gamers improve and enjoy their game experience since 2011. For the MMO Fashion network, she serves as author, moderator, and community liaison. Because there are only two of us, we can’t possibly keep up with updating all of the sites. Generally, we spend a lot of time working on a site when it first launches and then must rely on members of the gaming communities to submit items and help keep the site updated. As you can see from the table, once a site is established we may stop posting updates ourselves while continuing to post user submissions. We couldn’t possibly keep up with all of the sites without the help of everyone who has submitted images. Thank you for your assistance and support through the years as we attempt to create community-driven visual databases, character galleries, and guides for popular MMOs. Aeden and Errtai are TOR Fashion prolific posters who spend a lot of time helping others with their sets. Aeden wrote up some tips for taking screenshots and Errtai has written a post on creating fashion. D. Rose picked up working on the static armor sets after Kyne stopped. She accepted a user account so she can fix posts when Exile screws up tagging the categories. Her work for TOR Fashion has been outstanding with thousands of posts. Finnisterre volunteered to craft and take images of the missing AD, DC, and EP sets on ESO Fashion in the same manner that Exile takes pics and then went ahead and volunteered to take additional screenshots to help fill in more gaps. Haloa Ohana worked on WildStar Fashion for a short time, but had to give it up when she got a job. Kyne has an author account on TOR Fashion because of the volume of images he/she was sending in 2015. He/she did a great job of starting to add the static armor sets to the site and figuring out the modifier codes, but stopped posting in July 2015. Lautys started forums for TERA to allow people to upload their characters. Exile happened to see it and volunteered to create TERA Fashion in exchange for Lautys advertising the site within the TERA community. Njessi is the owner of Hawtpants of the Old Republic and is Exile’s sounding board for changes to the sites (and fashion) as well as providing CSS technical experience. oneRhino provides paid technical support for anything Exile can’t figure out how to do on her own. Ruinous-Maximus designed and donated the logos for TOR Fashion, TOR Decorating, ESO Fashion, BNS Fashion, BDO Fashion, ArcheAge Fashion, GW2 Fashion, RO Fashion, WildStar Fashion, TERA Fashion, and Exile’s personal logo. Sisqi has an account on TOR Decorating and standardized posts, fixed similarity sections, and updated themes. She also wrote up a fashion guide for TOR Fashion. She has since switched to Elder Scrolls Online and was kind enough to invite Exile to her guild and helped her level characters that languished for years. SWTOR Miner helped out with both TOR Fashion and TOR Decorating by providing datamined files so Exile could create the Similarity sections for weapons sounds, build the voice modulation pages, and provide Guild purchase costs for stronghold decorations. With 4.0, he decided to no longer provide any support to the sites. Vee of Ask Mr Robot started TOR Fashion with Dulfy in May 2012. She maintained the server and paid the bills until Exile took over in November 2013. She is no longer involved with the sites, but we appreciate her help in getting them started. Wondo sent in an amazing number of submissions from the Korean client of Black Desert to help us get BDO Fashion up and running and sent in additional submissions once the English client went live. This is a list of software we use for the sites and to obtain images/videos. NOTE: All of the sites are hosted by LiquidWeb. The MMO Fashion network costs about $25 per day to run in scheduled costs (server fees, plugin and domain renewals, game subscriptions). Unfortunately, unscheduled costs (technical support, in-game currency, new and upgraded software, temporary bandwidth upgrades, etc.) are quite a bit higher than that. We run ads by Curse. If you are an advertiser looking to advertise on one of the MMO Fashion sites, please contact Curse directly. We are not interested in any other company taking over advertising for us.